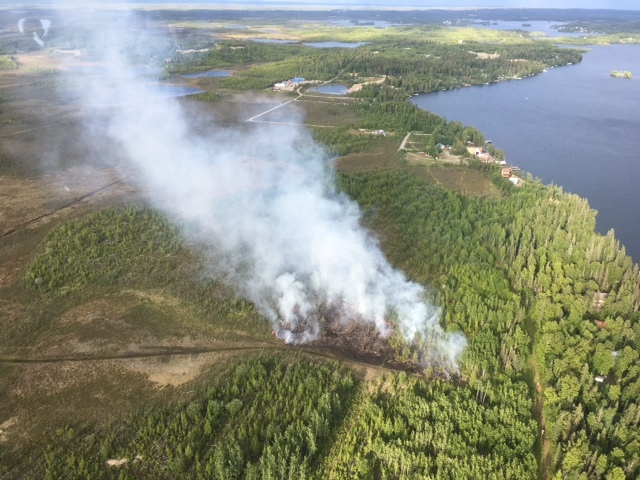 Alaska Division of Forestry crews worked late into the night and early Sunday morning to contain a fire near Big Lake. Six DOF firefighters stayed overnight on the fire – named after the nearby Call of the Wild Road – and picked up where they left off at 7 a.m. to get the 3.8 acre fire contained three hours later. The fire was reported at about 7:30 p.m. Saturday burning on the northwest side of Big Lake. When wildland firefighters and engines got on scene, they found people already trying to keep the fire from spreading to a nearby cabin. At that time, the fire was one to two acres in size and burning in heavy fuels including a mixture of spruce trees. Unfortunately, the fire didn’t have road access and the DOF engines were not able to get close to the fire. Firefighters were still able to get to the fire via a four-wheeler trail. Luckily, the area is surrounded by lakes. A helicopter was called in to dump bucket loads of water while ground crews were busy constructing a hose and saw line around the fire. Firefighters were able to knock down the fire edge shortly after 10 p.m., but continued to work on containment until around midnight. The six firefighters were back at it the next morning and were able to get a control line completely around the fire to stop its spread shortly after 10 a.m. More firefighters will join them today to mop-up any hot spots that remain. The exact cause of the fire has not been determined, however it is suspected to be human caused due to the origin’s close proximity to a four-wheeler trail. For more information, call the Fire Information Officer Beth Ipsen at (907)356-5511 or eipsen@blm.gov.